“Be a Hero” activities use American heroes to provide students with specific, positive feedback about their behavior. “Be a Hero” activities can also be used to teach a variety of standards in Social Studies, English Language Arts, and Counseling. The activities can be incorporated and adapted easily to meet the needs of students. 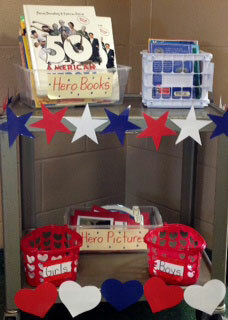 There is a Hero Display in our classroom. I chose American heroes from the book 50 American Heroes Every Kid Should Meet by Dennis Denenberg and Lorraine Roscoe. The display includes each hero’s name, picture, and virtue. The display also includes the book 50 American Heroes Every Kid Should Meet, other books and information about the heroes, and a poster of the virtues and their definitions. 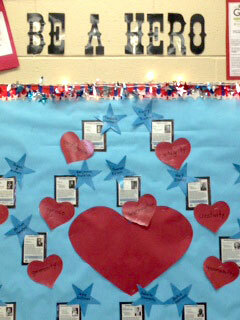 As students in our classroom display the virtues of the heroes, they earn a ticket. For example, a student showing “patience” would earn a Susan B. Anthony ticket. A student showing “honesty” would earn an Abraham Lincoln ticket. Students can refer to the hero display to find out information about the hero and the virtue they emulated. Students keep track of their tickets in a “Ticket Journal” that they bring home at the end of each month. In this journal, students record the date and reason they earned each ticket. They also reflect on the past month, and create a goal for the upcoming month. As students earn tickets, they write their names on the back and put them in a container for a drawing to be held at the end of the month. Students also keep track of their earned tickets on a “Hero Game Board”. They earn points during the month and can “spend” their points at the end of each month. Each week we focus on one hero. During the week we read about and discuss the hero. Students document their learning on graphic organizers. They also participate in a variety of activities based on the heroes, including the monthly game. Additionally, we discuss and learn about the heroes as they relate to our Social Studies, ELA, and Counseling standards.